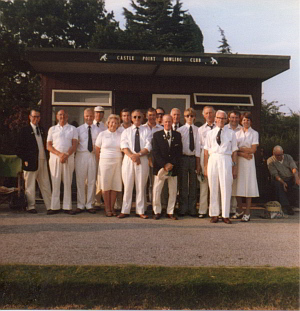 Castle Point Bowling Club was formed in 1980. The Bowling Green had been constructed in the 1970s when the Woodside Park open space was acquired by the then Benfleet Council and converted into a park. The original Club, Manor Hall, had closed through lack of members and the Bowling Green had fallen into disuse. The first task facing the founding Members of Castle Point, Brian Eaton, Ken Griffiths, Jim Hall, Len Jones, Dave Underhill and Fred Westgate, was to restore the Cumberland turfed Green into a usable bowling surface. The 6 founders had all played indoor bowls at the Waterside Sports Complex where they enjoyed first class newly constructed facilities and equipment. The facilities at the Green were somewhat different, consisting of a 6 foot square wooden hut which housed the equipment used during matches, but gave no capacity for changing accommodation, refreshments or toilet facilities. The Club added winter indoor bowling in the early 1980’s with organised bowling sessions at the Waterside Sports complex. Membership grew to 100, a figure which has, over the years, remained constant although the early years waiting lists are no longer such a feature for the Club. 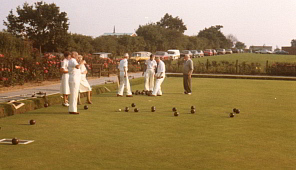 The indoor bowling continued through the 1980’s but eventually Members preferred to play for other established Indoor Clubs in the area and the organised games at Waterside ended. At Woodside Park the Club joined the Essex County Group 6 League and the Basildon & District league in 1982, competitions which have been played in ever since. In 1984 the Ladies won the Essex County Double Rinks Fours Cup, an achievement which remains, to this day, the most prestigious success the Club has had. During the first half of the 1980’s, through hard work and financial contributions by Club Members, the original Club hut was enhanced by the construction of changing rooms and a toilet block with the addition of electricity to the site in 1986. All was settling down well, with the Club concentrating on the task of maintaining the quality of the Green, a well known and ever present challenge for Bowls Clubs across the country. The Club performed well in League competitions winning the Group Six Division 1 in 1987. Then, on the night of 15th/ 16th October 1987, disaster struck – the well documented hurricane swept across the South East of England leaving a trail of devastation in its wake and the Club’s shed ‘ strewn over the unmade road at the back of our Green ‘ and ‘ encroaching on the bungalow property at the back ‘ according to the Club’s Committee Minutes. The changing rooms and toilet block were unharmed. This could have been a significant setback to the progress of the Club but hard work by the Committee and Members, plus the support of Castle Point Council, had a brick built Clubhouse erected in the summer of 1988. The Club also pushed on with a trio of successes on the Green with the Div 1 title in the Basildon & District League, winners of the Basildon & District Murrayfield Cup and, for the third year running winners of the Rona League Cup. With the new Clubhouse in place, the hope was a period of stability and success would be enjoyed. It was on the Green with the Ladies winning the Jubilee Cup in 1992, triumphs in 1990,1992 and 1994 in the Rona League Cup and in 1994 in the Murrayfield Cup, to give a notable double in that year. Unfortunately that stability didn’t extend to the newly constructed Clubhouse, which suffered from subsidence soon after being built. Cracks began to appear as early as the 1991 season. By the mid 1990’s there was a need to address the problems with the Clubhouse, changing rooms and toilet blocks. Discussions with Castle Point Council took place on the need to knock down what was there and replace with a new integrated Clubhouse. The Club established a building fund to raise money towards the cost but the shortfall required to be funded by the Council was too large. Throughout the 1990’s the Club continued to occupy the existing premises, mending and ‘making do’, whilst searching for a solution to the fund-raising dilemma. Membership remained at, or just above, the 100 number, the Green was in constant use and competition successes continued – In 1997 the Club was Basildon & District Division A Champions. In the early 2000’s, the Council were able to contribute a substantial amount, which was partially used to install an automatic sprinkler system on the Green (relieving the hand watering duties undertaken by Club Members alongside the Greenkeeper) but more importantly, when the balance was added to the Club’s building fund, this gave the cornerstone from which additional funding could be raised. Grants were received from the Cleanaway & Pitsea Marshes Trust, Foundation for Sport and the Arts and The National Lottery which, when added to the funds already there, allowed the Club to finance the construction of a new Clubhouse in October 2005. Much of the work was carried out by Club Members over the winter of 2005/2006. It was a memorable day for many Club Members, who had planned and worked towards the construction of the new Clubhouse throughout the 1990’s and into the 2000’s, to see Bob Spinks, MP for Castle Point, declare the Clubhouse officially opened on 21st May 2006. During 2006 Club Members demolished the old changing rooms and toilet blocks and restored the original pavilion for use as a storage facility. This, coupled with the erection of new palisade fencing around the site plus further block paving around the edges of the Green, completed the major improvement project commenced at the turn of the century. The opening of the Clubhouse allowed the Club to introduce Short Mat Bowling in 2006, when two mats were purchased. The Club entered the South East Essex Short Mat League in 2007, winning Division Seven and gaining promotion to Division Six. In September 2008, a second team entered Division Seven of the League and finished the season in second place thereby gaining promotion to Division Six and giving the Club two teams in Division Six for the following season. Over the Summer of 2008, the Ladies enjoyed success in the Castle Point Shield and reached the Final of the Basildon & District Presidents Cup. Unwelcomed and regular visitors to the Green over the Summer were a pair of foxes who delighted in digging holes in the surface, despite the best efforts of the Greenkeeper to dissuade them with wire fencing and netting. Eventually the foxes moved on and the Green soon recovered. The Club enjoyed a good Summer in 2009, with wins in the Basildon & District Rothmans Trophy, Runner Up in Division Two of the Basildon & District League and Runner Up in the Bestax Triples League. The 2009/10 Short Mat season saw the Club continue to advance in the South East Essex Short Mat League. The Club had three teams playing in the League. The A team gained promotion from Division Six to Division Five, the B team finished 3rd in Division Six and the C team were 4th in Division 7. Around 60 Club Members were regular players of Short Mat at the Clubhouse during the Winter months giving the Club an established pattern of continual bowling activity throughout the year. At the start of the 2010 Summer season the Match Secretary calculated the Club had 148 fixtures to play. The 148 fixtures would involve the bowling of 94,146 woods, the eating of 2,772 biscuits and the drinking of 1,336 cups of tea. The tea and biscuits did the trick sustaining the Club to Runners Up spot in the Basildon & District League One, the Trophy in the Basildon & District Murrayfield Cup, Runners Up spot in The Basildon & District Rothmans Cup and the Club Men’s Champion, Tom White, to Runner Up spot in the Basildon & District ‘Champion of Champions‘ Competition. 2011 started with success in the Short Mat South East Essex League, with the Club winning Division Five and continuing the steady climb through the divisions of the League. Off the Green, the decision was taken to replace the old Clubhouse with a new Storage Building. Veolia Pitsea Marshes Trust matched funds raised by the Club to cover the cost of demolition of the old Clubhouse and construction of the Storage Building. The work was completed in October 2011. 2012 saw the Club consolidate in the leagues and once again reap success in the Cup competitions. 31st July saw the Club’s squad win the Basildon & District Charity Day at Gloucester Park. The Triples Team gained Runners Up place in the Basildon & District Triples Competition. The Castle Point Ladies Shield and Castle Point Sports Trophy were both retained for the second season and this feat was repeated yet again in 2012. In 2013 the Club won the Basildon Ladies Trophy and in 2014 the Basildon Sports Trophy and Castle Point Shield were won and the Castle Point ‘B’ Team achieved promotion in the Basildon and District League. 2015 was a very successful year for the Club. The ‘B’ Team once again achieved promotion, the ‘Group 6’ Team were Division Four Runners Up, The Castle Point Shield was retained and Club Champion, Tom White, won the Basildon and District ‘Champion of Champions’ competition. In 2016 our successful run continued. Tom White won the Basildon and District Men’s Singles Championship, the ladies once again retained the Castle Point Shield and the A Team were promoted to Division 1 of the Basildon and District League. At this time, it was evident the Clubhouse was showing signs of age and damp. It was decided to look at the possibility of having the building re-clad and with the help of a grant, this was carried out, giving the clubhouse its current bright, clean green look. Total Membership of the Club across the Summer, Short Mat and Social membership totals in excess of 100, all of whom enjoy the bowling and social events organised throughout the year.